Your Workplace OnlineWorkplace Online is the web portal that users within a team can use to access their data and administer their team. dashboard is an integrated, intelligent overview of all your recent project activities. You can instantly and securely view files and folders that are important to you from here. 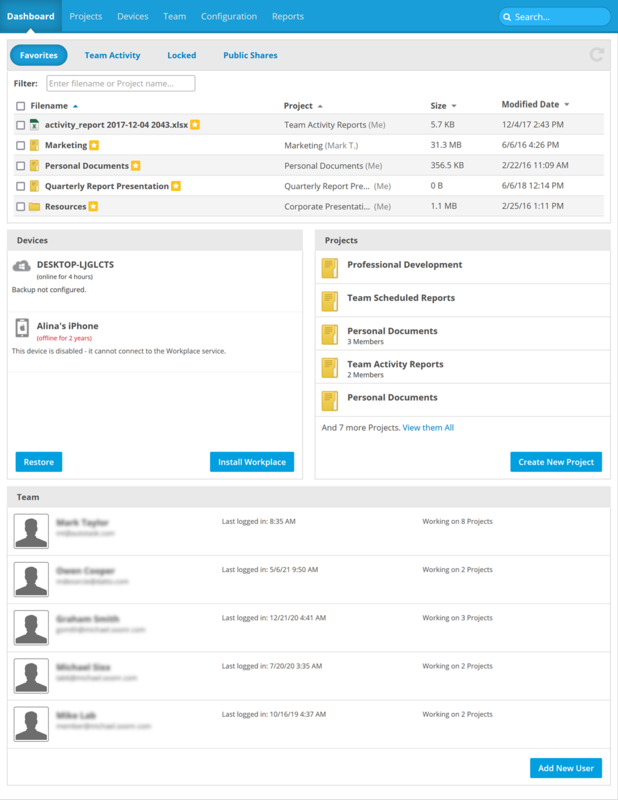 The dashboard also tracks changes and revisions automatically and lists comments and changes your team makes to documents chronologically, so you can see what your colleagues or clients have done and take action efficiently. The dashboard is comprised of several areas. The file list at the top of the page will change, depending on which dashboard view you've selected. The bottom of the page is always displayed, regardless of the file list you're viewing. It is comprised of information about your account, devices, projects and team. Depending on which dashboard view you've selected, you'll see a list of your Favorites, Recent Changes, Locked Files, or Public Shares. You can filter any of these lists by file name using the Filter field. Your "favorited" files are marked with a icon. In the Recent Changes list, you can also filter by Event Type, UserA user is anyone with access to Workplace., ProjectA project is a top-level folder within Autotask Workplace. A project is the primary container for all the folders and files that are synchronized by the Workplace service. Projects create the basic organizational structure to store data and control user access., File/File Location, and/or Date. To access all available functions, hover over the item and click the icon, or right-click the item. Then select one of the options from the resulting menu. The Account Information area contains a summary of the information configured on the Personal Information page. To modify this information, click the Edit link. This area also displays a summary of your storage usage which indicates how much storage you've used and how much is still available, as well as your current backup status. The Devices area lists the devices associated with your account, and indicates whether or not it is online, and if, how long it has been online. It also provides the sync and backup status of the device. If you place your cursor over the item, you'll see the link that enables you to Disable a lost device. You can also restore a device from here. The buttons at the bottom of this area allow you to Restore a device or Install Workplace on a computer, below. 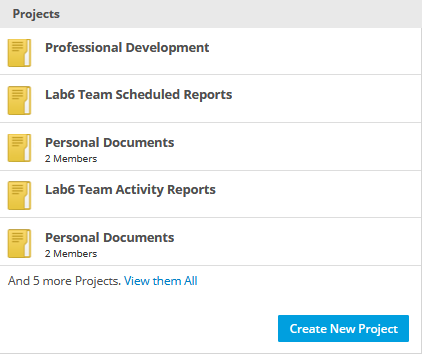 The Projects area lists the projects for the team account you're currently viewing. To see the full list, click the View Them All link. The button at the bottom of this area allows you to create a new project. For more information about projects, refer to About Projects. The TeamA team is an entity, usually a company, which subscribes to the Workplace service. A team is made up of members and connections. area lists all the members of the team account you're currently viewing. To see the full list, click the View Them All link. Click a team member to view their Team Member Details. Begin typing the name of the file or the name of the project you want to filter by in the Filter field. The file list will update automatically as you type. If you have not selected a default document editor, you will be prompted to select a document editor when you open the file. To see all available management options, hover over the project, folder, or file and click the icon, or right-click the item. Then select one of the options from the menu. The menu options will vary, depending on which view of the dashboard is displayed and which type of item you've clicked, as well as your permission for the item. For detailed information on all functions available for each dashboard view, refer to Favorites, Recent Changes, Locked Files, or Public Shares. Click the Edit link in the Account Information area. For more information, refer to Personal Information. In the Devices area, place your cursor over the device you want to disable. To wipe any synced files stored on the computer the next time it connects to the Internet, select the Wipe on Connect check box. Only files stored in the Workplace folder will be deleted. 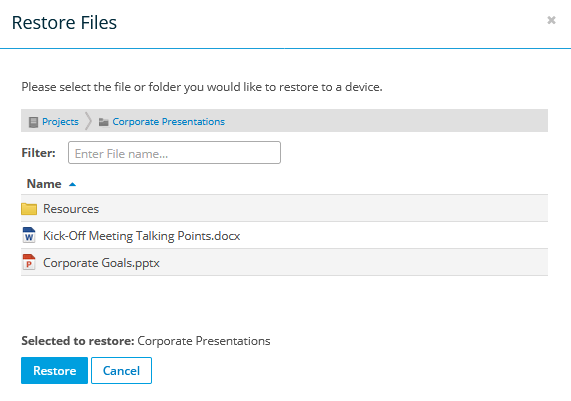 In the Devices area, place your cursor over the device to which you want to restore files. Select the folders and/or files you want to restore to your device. The items you have selected will be listed below the folder tree. In the Devices area, click Install Workplace on This Computer. Alternatively, you can click the Download link on the Workplace Login page and download the Workplace Desktop app from there. Follow the on-screen instructions to complete the installation. When prompted, enter your Workplace username and password. You must be logged in to Workplace to download the required MSI file. 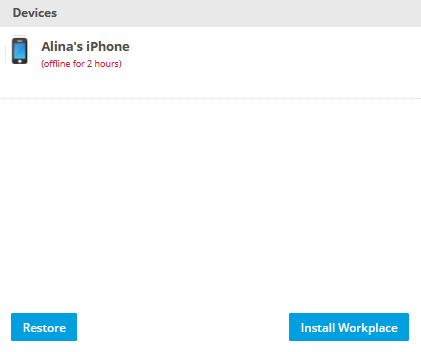 Click the Install Workplace button. Click the Download Workplace DesktopAlso known as the Workplace Desktop app, and in the context of this documentation, simply "the app," Workplace Desktop is the software installed on a computer that is responsible for synchronizing data between the local drive and the cloud. for AD GPO installations link. Further information about deploying via AD GPSI can be found here. In the Project area, click a project name. Click the + Create New Project button. By default, you will be the project owner. In the Team area, click a team member's name. This will open the Team Member Details page.